The #wordcountpodcast Episode 70 is now open for submissions! Outside smells like football, the evenings and mornings are chillier. Now that I’m back at school, albeit online classes, Autumn seems even richer to me. 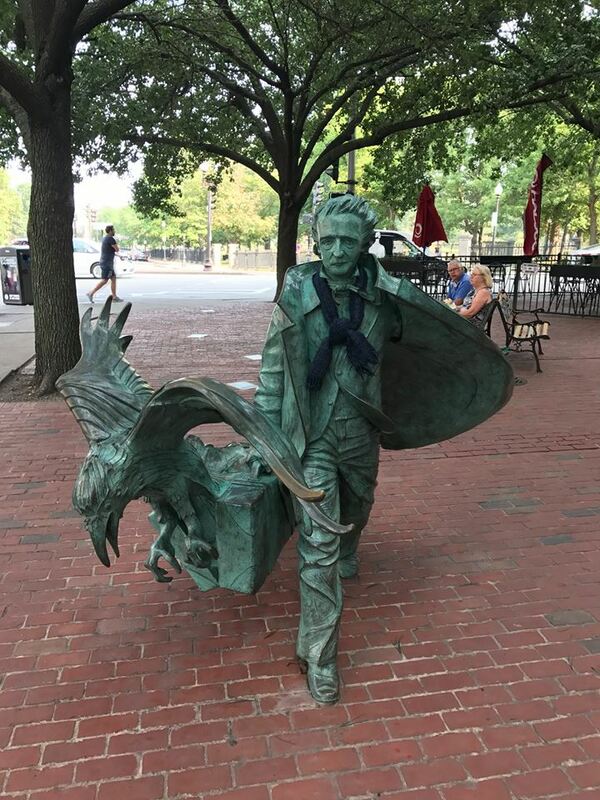 You can read about the statue and of Poe’s opinions on Boston over at this Boston Magazine article. My theory is that he was a Yankee fan. Anyway, the telltale poet’s statue and the month of September are the dueling prompts this time around. Our #Irregulars should be all over this one! There are sixty-nine shows available right now! DEADLINE: I must receive your submission by Friday 22 September 2017 by MIDNIGHT Eastern time. Send your file to me@rbwood.com (or via the dropbox link I can provide) by 22 September 2017. You can also e-mail me with questions beforehand. I do reserve the right NOT to post your submission, but will communicate that to you should it be the case. I add the ‘Explicit’ tag to the ‘cast, so if your story uses adult themes or language that’s ok—but it should be necessary for the story.